The badger is classed with the Ursidac, and in some ways shows considerable affinity to the bears, as for instance in his great muscular development, shambling gait, and chiefly in his plantigrade method of walking with the whole foot, from heel to toe, upon the ground. The thirty-eight teeth with which his enormously powerful jaws are armed betray the omnivorous nature of his diet. He measures some 3 feet in length, including the short tail of 5 or 6 inches. His short and powerful legs and feet are provided with long and strong claws, particularly the fore-paws. His height is barely a foot, so that with his long coat he appears to brush the ground. In colour the upper parts are of a uniform silvery grey, the individual hairs being banded with blackish-brown and white, the underparts and legs are black, the head white with a black stripe on each side from the nose over the eye and ear. A full-grown badger weighs from 20 to 30 lbs., the male being somewhat the heavier. Mr. A. E. Pease, M.P., in his monograph on the badger,, says that they have been known to weigh up to about 40 lbs. ; but that the heaviest that he had ever weighed in his own experience scaled over 35 lbs. The jaws are immensely powerful, the under-jaw, as already remarked by Blasius, being interlocked with the upper jaw ; the canine teeth of the under-jaw are particularly long and strong. Under the tail is situated a glandular pouch in which is secreted a strongly-smelling substance. Opinion seems to be divided as to the use of this secretion, some holding that the animal derives nourishment from it during its winter retirement-a view which one is somewhat surprised to find favoured by Mr. Pease-it seems too much akin to the old belief that the bear subsisted by sucking its paws in winter, to obtain ready credence. Von Tschudi, speaking of this belief, remarks simply that it is false. Of strictly nocturnal habits, the badger spends the day below ground in his earth, in the formation of which he shows perhaps more intelligence than in other directions. The tunnel is long and deep, and frequently branching, each terminating in an enlarged living chamber, and each earth having several exits or bolt-holes. The living-chamber is warmly furnished with dry grass, moss, leaves and bracken, replaced yearly by fresh material. Mr. Pease gives an interesting account of the method by which the badger carries in his bedding, retiring backwards into the earth with the heap of material gathered into a bundle between his fore-paws and his head. The badger is often spoken of as solitary in its habits, but this seems to be erroneous ; he is monogamous and is said to pair for life. Mr. Pease once enjoyed the singular spectacle of seeing no less than seven full-grown badgers issuing at night-fall from one earth. Another imputation against him, that of foul-smelling and unclean habits, is also unfounded. His earth is usually sweet and clean, the animal retiring when necessary to some distance from his habitation. There is a tradition, repeated by the German writers, that the fox is in the habit of evicting his powerful neighbour from his comfortable abode by means of be-fouling the chamber of malice prepense ; but this also is groundless fancy, for foxes and badgers are known to inhabit the same earth; such earths, it must be remembered, being often very large and with many ramifications. Here, about the month of March, the young come into the world, according to Mr. Pease usually two, sometimes three, never more than four in number, although the German writers say from three to five, and give January and February as the usual dates ; but locality and climate may account for the difference. In the matter of food the badger is decidedly omnivorous, nothing, almost, seeming to come amiss. All manner of roots, vegetables and fruits, beetles and insects of all sorts, reptiles, snakes, young birds, eggs, mice, and the smaller animals generally, all seem welcome. Honey and wasp-grubs have special attractions for them as for their distant relative the bear ; and on the continent of Europe they do at times much damage in the vineyards. In this country there is no doubt but that young rabbits are a favourite delicacy, and it may be accounted to the badger for righteousness that he helps to keep down these ubiquitous pests. On the whole he may be regarded as a harmless, if not absolutely a useful animal; but that an occasional individual may develop abnormal and vicious propensities cannot be denied. A striking instance of such depravity has come to my knowledge. A forester living in a remote cottage in the heart of one of our largest deer-forests had a number of fowls in a rude turf-covered out-house. One night there was a great outcry among the fowls, and in the morning it was found that some animal had forced an entry and carried off one or more of the inmates. The door was made secure, but next night the alarm was renewed. At daybreak the forester found that the burglar had this time obtained entrance through the roof, and being unable to return that way, remained a prisoner. Fetching his gun, he had the satisfaction of slaying a large badger, caught flagrante delicto. Such cases must, however, be considered as exceptional, and analogous to that of the squirrel that has acquired the bad habit of robbing little birds’ nests of eggs and young, or of the very rare case of a kestrel that has taken to carrying off young pheasants from the rearing-field; perhaps as protest against modern unsportsmanlike excesses in artificial game-rearing! A number of years ago there was some correspondence in The Field as to the alleged destruction of fox-cubs by badgers. In the end the question remained undecided as to whether such cases as had undoubtedly occurred had been the work of some bad-tempered old badger, or of an old dog-fox of similarly unamiable character; they could not be attributed to any general habit of the species as a whole. It seems to be agreed on all hands that badgers are a thirsty race and drink much water. The popular notion that the badger hibernates, as the dormouse, for instance, does, is incorrect. They spend, indeed, much of the winter in sleep in their cosy underground chambers, especially in long-continued hard weather; but the unmistakable evidence of their footprints shows that they do come forth at no very long intervals. 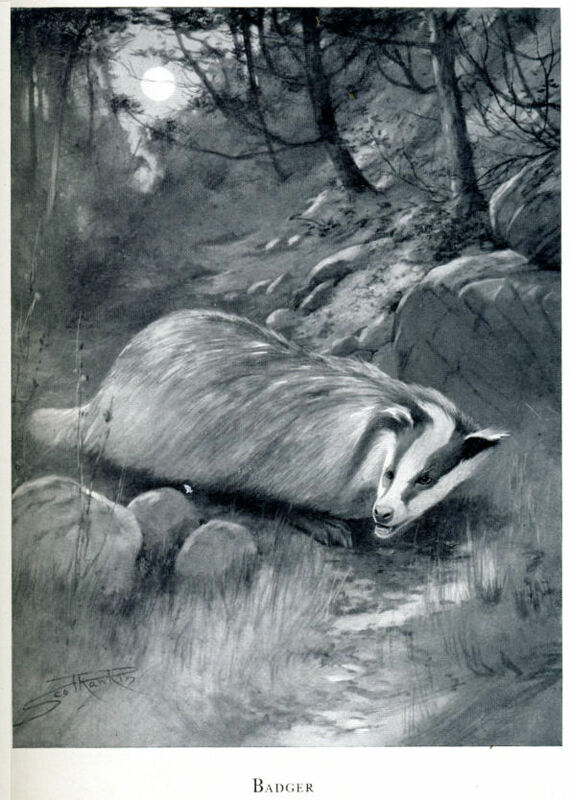 Although the badger may sometimes be seen sunning himself just within the mouth of his earth, he seldom or never issues forth until nightfall, when he goes out on his rounds after food, returning before daybreak; indeed, if he should perchance have somewhat miscalculated his time, he comes shambling and rolling home in a great hurry. One of the means of capturing him is by means of a sack pegged inside the mouth of his main entrance during his absence, with a running cord round the mouth of it, secured to a peg. The badger, being found in his rambles and pursued by dogs, rushes in precipitately and finds himself a prisoner. From his cunning he is difficult to catch in ordinary spring traps. The usual method of capturing him, at least in the south, is by locating him first in his tunnel by means of terriers, and then digging down until he is reached—a work often of much time and toil. If the attention of the badger is not continuously held by the terriers, he will scrape his way into the earth faster than the hunters can dig after him. A full account of this procedure is given by Mr. Pease in the monograph already mentioned. His captives were not killed but released elsewhere. In Scotland this method is seldom very practicable, as our badgers are usually found in rocky ground or in cairns; or else in earths on a hillside where digging would be too much like railway-tunnelling to be feasible. In Germany the Dachshund or `badger hound' takes the place of our terriers. The German writers speak of the flesh as eatable; and the fat had, both there and here, a great reputation as a cure for rheumatism. There used to be, and may yet be, a very general custom in South Germany of hanging a badgerskin as an ornament on the harness or collar of farm horses. Our ancestors had a quaint belief that the badger's legs were shorter on one side than on the other, the better to run along a hill-side! The difficulty of the return journey does not seem to have occurred to them. This story probably had its origin in the shambling, rolling gait of the animal. The name badger is said to be derived from Latin bladarius, a corn-dealer (cf. French blaireau), from a supposed habit of storing up corn for winter supply. Sir Herbert Maxwell tells us that in Middle-English Bager meant corn-dealer. The Scottish name brock is of course the same as the Gaelic and Irish broc, Cornish and Breton broch, the root being apparently doubtful. There is evidence of its former wide distribution in the place-names still extant, both in the Lowlands and, more rarely, in the Highlands ; as `Brocketsbrae, Brockhole, Brockloch, Brockwood, Broxwood' in the former; `Garaidh-nam-Broc,' badgers' den, to take only one example in the latter. For obvious reasons it would be unwise to define more particularly the existing haunts of this interesting animal. Is it too much to hope that those who are in a position to do so will exert their authority and instruct their keepers and foresters to leave the few remaining representatives of this ancient British race in peace?